Basseterre, St. Kitts, July 16, 2018 (SKNIS): The Apostolic Faith Mission Church Incorporation Bill 2018 was read a third time and passed into law in the St. Kitts and Nevis’ Federal Parliament on Friday, June 13. Senior Minister and Minister of Ecclesiastical Affairs, the Honourable Vance Amory, said that the institution made a bold move in wanting to be officially supported by the State. 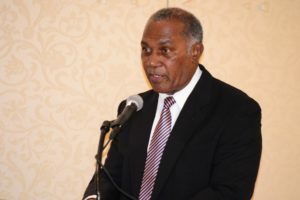 Senior Minister Amory used the occasion to commend the church for all it does in society, while at the same time highlighting some of its involvement within the Federation of St. Kitts and Nevis. Minister Amory also saluted the church for hosting appreciation services for the Police and Defence Force as a way to honour those persons who go above and beyond the call of duty and provide security in St. Kitts and Nevis. Senator the Honourable Akilah Byron-Nisbett fully supported the Bill, and that of the Lighthouse Baptist Church Ministries Incorporation Bill 2018, which was also passed on the same day. She gave a brief overview of the role of the church. Senator Byron-Nisbett noted that churches are true community churches as “each brick laid and each window placed was done through community effort”. The Apostolic Faith Mission Church dates as far back as 1958 when two female missionaries journeyed from St. Thomas to conduct evangelism work in St. Kitts and Nevis. The first church was built on Station Street in Sandy Point under their leadership and with the assistance of community members. The church was officially established on October 28, 1959.